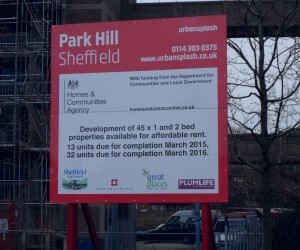 We have had a reply to our letter to the Council concerning Park Hill. Councillor Harry Harpham says that 185 refurbished flats will be available by March 2016-but this is still 14 months away. His figures do not tally with the big Urban Splash noticeboard on South Street which only claims 45 properties will be available by March 2016, so we don’t know which to believe. Meanwhile the rest of the estate continues to deteriorate. Manor Castle Greens will continue to put pressure on the Council and Urban Splash to speed up this work. It is ridiculous that people are homeless when all these flats are empty. There has been some positive news with the announcement in the Sheffield Telegraph that seven companies are set to move in soon. Grace Owen Nursery will soon be moving in to the new school near the main entrance by Park Square. Manor Castle Greens are concerned about the road safety on the stretch of new road where there is no pavement. at the end of South Street. Some cars have been seen speeding on this road, even though it was designed with a zig-zag kerb to make drivers slow down. When parents with young children will be walking here to and from nursery it is vital that drivers take more care. We will be pressing the Council for better signage to discourage speeding. As you have noticed work is ongoing on the internal fit out of the remainder of the flats in Phase 1. The first 78 flats were occupied from January 2013, and the remaining 26 flats on Gilbert Street will be completed towards the end of February 2015. 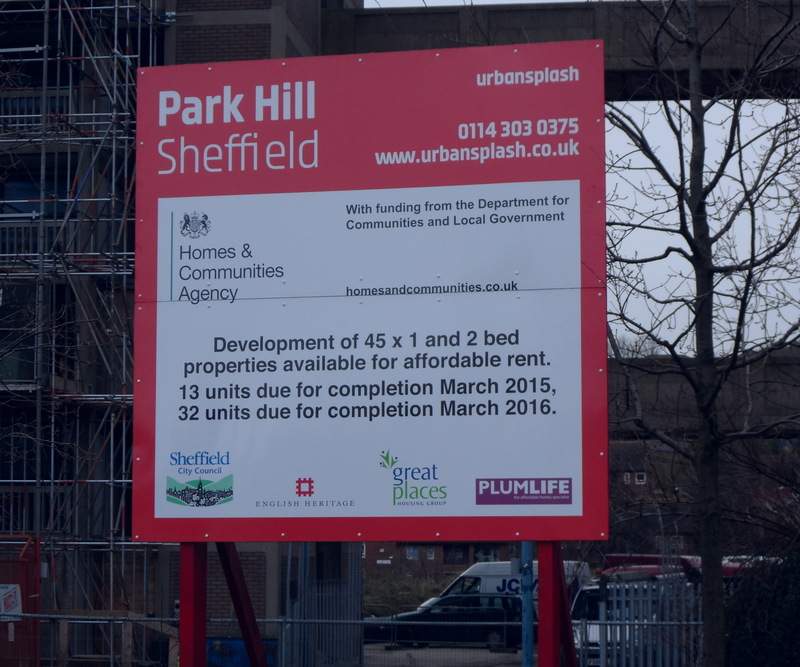 The remainder of Phase 1 at Park Hill will be completed by the end of March 2016 meaning that approximately a further 185 homes will be available. These flats will be a mixture of housing for rent, affordable, and outright sale. We meet regularly with Urban Splash to discuss the future phases of the redevelopment and we do have Development Agreement with them that covers remodelling the whole estate. Urban Splash are currently drawing up a marketing and sales strategy for these future phases and are actively marketing the commercial space that is currently available. As you point out, it has always been the aspiration of all the partners to attract new retail and business opportunities to the area, and the ground floor at Park Hill has been fitted out with this in mind. You might be aware that two new businesses are operating from Park Hill, having relocated from elsewhere in the City. Unfortunately, it is difficult for me to give you a timeframe for when any new businesses will open. Urban Splash are the leaseholders for the whole of Phase One, and as such have both the responsibility and expertise to market the commercial space. At our last meeting, Urban Splash indicated that they are in discussion with a number of organisations, and regularly receive enquiries about the availability of space. I acknowledge that Duke Street local centre does not offer a variety of shops and services, but as you are probably aware, the shops and units there are in private ownership, and as such the owners and landlords will take a view on the commercial viability of opening any business. I hope that the information about the redevelopment timetable is helpful for you and am sorry that I cannot give you more positive news at the moment about the retail situation in the local area.